WEST LAFAYETTE, Ind. — The importance of sound as an element of manipulation can be easily overlooked in an age where there is an inundation of visual stimulus. Professor Richard Thomas, a sound design professor in the College of Liberal Arts and an Honors College instructor, aims to explore and educate students on the efficacy of sound and music in his HONR 299 course, “Music as a Chariot,” which is based on his book of the same name. A primary goal of HONR courses is to teach students how to think critically about ideas that they normally would not experience. This enables students to develop skills in interdisciplinary thinking. Throughout the semester, “Music as a Chariot” teaches students about the complexities of music and sound. Specifically, the students explore how to identify the manipulation of sonic energy in time and space using color, rhythm, mass/dynamics, line and texture, and effectively apply these elements to their own compositions. They also discover how music can control the perception of time, how ideas become attached to music and learn how music influenced Greek theater. “Music as a Chariot” is a project-based course that requires students to think about sound on a deeper level. The workplace is becoming an increasingly more diverse space, so being able to hear the world through different perspectives is becoming more and more important. This, and many HONR classes, provide students with a valuable, applicable experience that they can draw from when they graduate and move into the workplace. All Purdue University students maintaining a 3.0 GPA or higher are eligible to register for HONR courses. One outcome goal is for students to update the way they think about theater and music. After learning this material, the ability to be fully immersed in a work still exists, however an awareness of and analysis of the manipulation that is being created exists as well. “Music as a Chariot” can also be helpful in allowing students to recognize the responsibility that comes with attaching ideas to music and teaches the examination of the messaging. Music and sound extends beyond games, movies and theater to humans’ place in the world, and it is important to remain informed and to recognize when manipulation is occurring. AJ Trent, a senior in acoustical engineering, said, “When I took this class I thought I had an idea of what it was going to be like, but the material wasn’t what I thought it was going to be. Professor Thomas has a way of describing the music and how it relates to neuroscience without going into the technical jargon of either topic.” Instead, Thomas teaches his craft and helps students view it through the scientific lens that he developed through years of research. Years of his own research has made Thomas the perfect liaison to connect the two ideas. “I decided to perform research in audio acoustics and met some influential people during that process,” explained Professor Thomas of his time at Purdue University, where in 1980 he became the first person to graduate with a Master in Fine Arts (MFA) in sound design. “The audiology route led towards sound and hearing professions, but I realized I was more interested in art,” Thomas stated. This passion, and the compilation of research results and data over his career, eventually paved the way for his book. Professor Thomas has conducted lectures and webinars on this subject internationally for many years, and recently began teaching workshops based on his book including ones in Limassol, Cyprus, Cardiff, Wales, and an upcoming Fulbright appointment to Costa Rica. 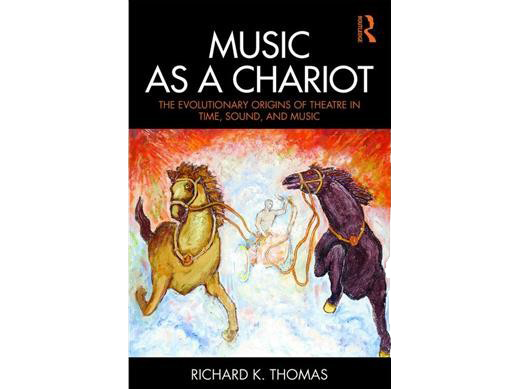 Those interested in reading Professor Rick Thomas’ book, Music as a Chariot, can find it here. Retired Purdue professor Al Pounders composed the cover art.